After trading at over U.S.$100 per barrel for some years, the price of oil began to tumble down around July, 2014, falling to below U.S.$30 per barrel. 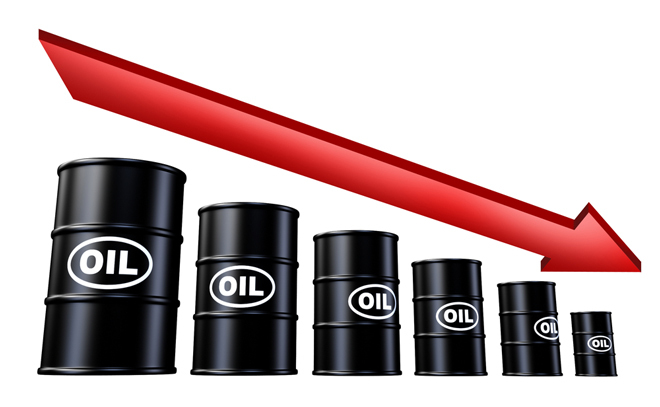 The collapse of the price of crude created serious economic crisis for oil-reliant countries, including Nigeria. It was not unexpected that Nigeria became one of the countries most affected by the downturn. Central to the economic crisis that would later befall the country was her over reliance on oil. Oil accounts for 69 per cent of exports, according to the National Bureau of Statistics (NBS) and around 70 per cent of government revenue. The impact started to be felt at the most unfavourable period, at the crucial time a new administration had just come into office. The slump in crude prices, Nigeria’s mainstay, hammered the country’s earnings, leading to a significant decline in the country’s foreign reserves and a free fall of the naira. The value of Nigeria’s crude export dropped by N2.2tn in the first half of 2015, NBS data for that period showed. The country’s crude oil exports for the first half of 2015 reduced to N4.3tn, from N6.5tn recorded in the first half of 2014, representing a 33 per cent decline in crude export value for the period. Within year 2015, the plunge in oil prices left states and local governments unable to pay workers for months. The Federal Government also struggled to pay federal workers. Compounding the impact of low oil prices, attacks by militants on oil and gas facilities in the Niger Delta in the start of 2016 cut crude oil production to as low as 1.3m/bpd, the lowest in almost 30 years, far below the 2.2m/bpd government’s 2016 budget assumption. Nigeria lost around N1.1tn crude oil revenue within months of the attacks on oil infrastructure in the Niger Delta in early 2016. Nigeria also lost its position to Angola as Africa’s top crude oil producer. In response to fiscal pressure caused by the collapse in crude oil prices, the country announced in May 2016 the removal of fuel subsidy that had cost billions of dollars. The removal which resulted in a 67 per cent increase in petrol price also saw the prices of goods and services across all sectors of the economy rise. The effects of the government curtailing subsidies, introducing austerity measures and tightening of its spending in response to low oil income, started to be felt hard in Nigeria in 2016. The naira fell and investors fled. In the second quarter of 2016, foreign direct investment (FDI) in Nigeria fell by 37 per cent year-on-year, while total capital inflows were down 75.7 per cent, according to the NBS. The economy also, in 2016, contracted, inflation hit 17.1 per cent in June, the highest rate in more than a decade; putting Nigeria’s status as Africa’s largest economy under threat. Nigeria’s economic plight sharpened in the July-to-September period, as businesses struggled to access foreign currency. Nigeria, Africa’s biggest economy, officially slid into recession for the first time in more than 20 years. According to the NBS gross domestic product (GDP) contracted by 2.06 per cent after shrinking 0.36 in the first quarter 2016. In spite of the above impact of the downturn, many of the challenges faced in the last three years have just started to ease due to what analysts described as emerging positive economic indicators. According them, growth in the agricultural and solid minerals sectors had continued to show better economic outlook for the years ahead. Extensive engagement with militants by the Federal Government has led to the termination of attacks. This has also resulted in the reopening of key export terminals and consequent increase in Nigeria’s oil production towards the 2m/bpd budget benchmark. Added to this recovery was OPEC’s decision to exempt Nigeria from the output cut deal reached late in 2016 to limit oil production so as to boost its price. Even though the agreement has not improved oil prices around the threshold Nigeria would want it to be, the price of crude, which traded below $30 a barrel in the last three years has appreciated to $50 per barrel in recent time. Annual inflation in Nigeria has continued to ease. For a fifth straight month in June 2017, inflation slowed to 16.1 per cent, according to NBS, compared to 16.25 per cent in May. Efforts by the Central Bank of Nigeria (CBN) to prop up the value of the naira leading to the drop in the parallel market exchange rate of the naira to the dollar to N370 from N500 and the rise in the country’s foreign reserve from $27bn at the beginning of the recession last year to over $31bn recently, are part of the positive indicators that economic recovery might not be long in coming. Secretary General of OPEC, Mohammed Barkindo, once described Nigeria’s ability to survive the low crude price era as a miracle, adding that the country’s worst days due to low crude prices were over.